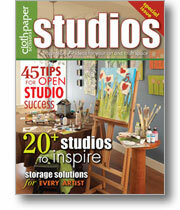 On Oct 3 Cloth Paper Scissors Studios magazine is hosting an on line studio tour of participating bloggers. I'm not really sure if I know what I'm doing here -- sometimes I seem to fumble my way through this computer stuff. I'm amazed when it works. Anyway, I'm supposed to show the picture with the link to the magazine 0n my blog, send an email to them to let them know and then I'm supposed to post pictures or a video of my studio. I don't think I'm up to posting a video yet -- mostly because I don't have time after work this week to figure it out, but I will try to post some photos. It's a pretty small room anyway, and it excited me to read that I don't have to clean it up first; I can show it as it is! 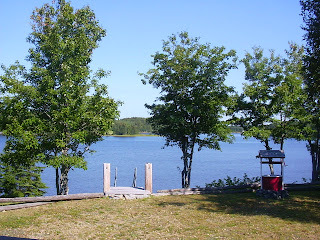 On Saturday I'm leaving early for Fredericton, but I think I can post the pictures before I leave. I stayed home from my yoga class to-night because I'm afraid I might be coming down with the cold that most of my students have had, so now I'm going to go putter at my machine for a bit. This morning after cooking and eating a leisurely breakfast, I sat and did my favorite crossword. I love to be able to lounge around on Sunday morning. 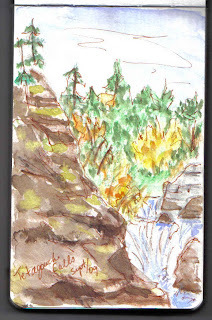 Then I headed to my art room where I did a quick sketch from one of my trail photos that I took yesterday. I learned a lesson about using a cheap journal, though, as I tried to use rubber masking fluid and Neo color II crayons, and when I tried to rub off the masking fluid, it tore the paper. When I'm away next weekend I will get a moleskine journal. I have one but it is small. I am posting a picture because I do like how it turned out and the colors. The horizon line isn't perfect because the paper was starting to ripple and you can see where the paper tore if you look closely ( I actually glued it). Also, the dark areas are where the paper rippled. My goodness I'm making a lot of excuses! I also took a picture of my design wall with all my UFO's on it. I did spend some time today cutting borders and bindings for all the little hangings, so I do feel like I accomplished something. 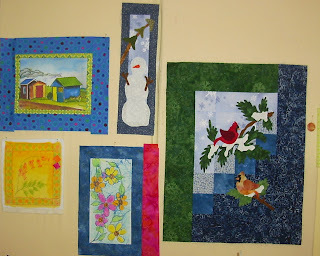 This morning I woke up dreaming about my next art quilt project. I was thinking about how I might use the discharge paste that I ordered when I glanced at my 'winning' wall hanging which is temporarily hanging on my bedroom wall. That little crtitical voice crept into my head and I wondered what the judges saw in it. The voice softly whined, "Perhaps you're wasting your time". I heard and answered back. No, I find beauty in art; it touches my soul; it fulfils me. Then a funny thing happened. I went and made myself a cup of tea, took it back to bed and flipped open the book Journal Spilling by Diana Trout. I read a few pages with some basic watercolor techniques, when I spied an article called Taming the Critic. It really hit home! I only read a few more pages, but the exercises on getting to know your critic are interesting and I am anxious to try them. I think I will get a lot out of this book. I just have to wait until next weekend when I go to Fredericton to get some gesso. Since today was the only day this weekend that was supposed to be sunny my husband and I decided to go to the Acadien Peninsula, bike part of the trail into Caraquet, and have lunch at Les Graines Folies where I also purchased four loaves of artisan bread to put in my freezer. (We managed to get 3 loaves in my side bags and 1 loaf in my husbands.) 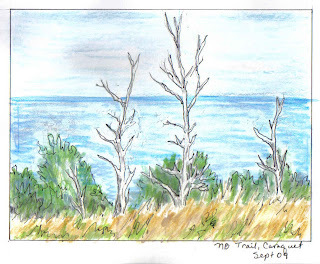 It was a round trip of 22 kms, pleasant enough once you got going, but a little cold in the wind along the shore, and thus too cold to do any sketching. I did stop and take a few pictures of the trail and as you can see, what is so nice about this section of the NB Trail is that it is paved. The leaves are still turning, so the fall colors are not at hteir peak, but it was still beautiful. 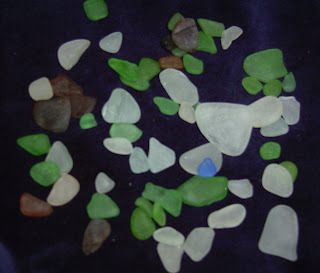 We even stopped at Grand Anse beach on tha way home where we picked a handful of sea glass. I just can't resist picking it up even though I'll never use it all! I'm thinking of having a couple of necklaces made for Christmas gifts. Maybe I'll do one for me too. I am heading out in a few minutes to go for a walk with my husband while the sun is still shining, but I just had to share the new books that I just received. I can see that I clearly need to work on my photography skills! I keep trying to blame the camera. The only book that I have opened is the Crochet Adorned by Linda Permann. It is lovely. 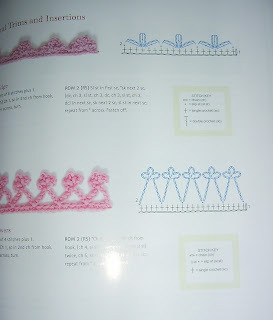 I like it because it is full of very easy to follow directions and great pictures of trims that you can crochet and add to just about anything you can think of. I have included 2 sample pages so you can see how clear the directions are. Sorry, the pages are little blurry, but I must hurry. Aren't the flowers spectacular? I haven't crocheted in a while but I am busy thinking of where I could put some of these flowers. It's not so easy to balance work and play. Some nights after a tiring day, you just have to listen to your body and take the night off. Last night I went to yoga after work, and I was too tired after dinner and packing lunch for today to do anything other than a doodle while watching TV. By the way, boy am I glad to finally have something new to watch! Not that I'm a big TV fan, but I do like to pick up the knitting needles and escape for an hour before bed. To-night I am really tired and I don't feel like doing much. I thought that if I'm not going to do anything creative I should at least take the picture of my winning wall hanging and post it. I did that without looking through the viewfinder due to the fact that I had to perch on the furniture to get the right distance. Of course when I uploaded the pictures to the computer and looked at them, they were a little crooked and I cut the top off. In my fatigue induced stupor to-night I have decided to post anyway-- you can get the idea. I am still truly amazed that this won first place in the modern quilt division. As I said I almost didn't send it. Someone must have liked it and that makes me feel really good. Perhaps I'll keep doing this. I got my wall hangings and ribbons back from the KV show ( so exciting), but I haven't taken the time to photograph them yet. The photo is of a "fairy hole" that I found-- the fairies didn't come out for photos though. To-night I got a surprise phone call from my friend Anne who told me that we had each won two ribbons at the Kennebecasis Valley Quilt Show held near Saint John, NB. 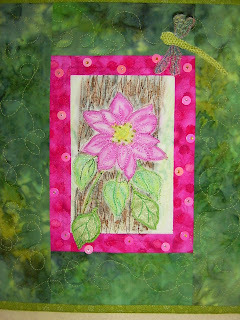 And, to top it off, I also sold two of my smaller wall hangings. To think that I would never have entered anything if she hadn't pushed me to do it. I was so excited when she told me of a first place in the Modern category that I didn't get what the other one was for, so I'll wait to post a picture of the winning ones when she brings me the ribbons and the quilts. In the mean time I will post a picture of the two that sold. 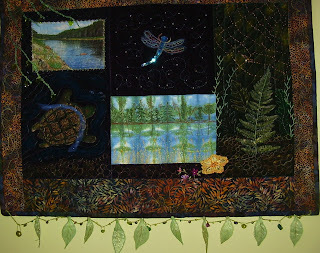 The one I called Seashore is about 12 by 14 printed with a handmade stamp, free motion quilted, painted, hand embroidered and beaded. The picture doesn't really show all the details. The second one is painted on white fabric with Neo Color II crayons, free motion stitched, beaded, and the dragonfly wings were done separately with needle lace. It is about 9 by 12. It's enough that it's my first 2 weeks of work, but I also had appointments 3 days in a row after work. It was mostly unavoidable. To-night I had a hair cut, came home for a quick snack and then went back out for yoga since I missed the Tuesday night session. I'm trying to go once a week. Once I finally got home, had something to eat,(my husband had done barbecue veggie burgers) and cleaned up the kitchen, I went outdoors in the yard to cut some hydrangea. Here they are in my living room. I so love the soft colors and the fact that they will dry and stay that way all winter. I am tired. It will get better. It is after all only my second week and my first with my students. The first few weeks are also busier than the rest, so it will settle down. I was late getting home to-night though because I had an eye appointment. I am including a photo of another wall hanging that I put together on Sunday. I'm trying to get a head start on some Christmas presents for each of the 'mothers' in my life. It is from a pattern called Hangin Lites from Patch Abilites. Also, I am working on the one of the flour paste resist fabrics that I showed in an earlier post. I am pleased with it but not quite ready to post it yet. I have more pictures this morning, but not art work, unless you consider it Mother Nature's artwork. What a day it was yesterday! We just had to get out, so we headed to the Beresford Beach lagoon where as you can see it was spectacularly calm. It felt like summer temperature wise-- event the water was not so cold. well, it is after all still summer, though just barely. It was quieter because of the 'summer people' having left already. This morning after a leisurely breakfast and some time with the crossword puzzle, I hung out a load of clothes, and we're heading out for a bike ride, hopefully before it rains. I'm hoping to spend some time here in my studio with some fabric and artwork later today. I have just finished my first week back at work, so I have done very little creative work. Last night after errands and a walk, I was musing about what project I might like to work on next. I was wandering around the house and thought it might be interesting to include some photos of some of my favorite things. The first picture is of a corner of my living room- there is an antique chair form an aunt who passed away, an outdated lamp that was a wedding gift form my parents, a flip top table handcrafted by a neighbor of my grandmothers, and a painting that was given to me by my mother after my father died. The 2nd is of a wicker shelf in my bathroom; it is my ode to white, I love the look, but I couldn't have it through the whole house; color just keeps creeping in! The last picture is of a $3 flea market jewelery box that I painted and added knobs of beach glass.On top of that is a small collection of vintage brooches, and behind that is a poster done by my friend Nicole Boudreau. This morning I was reminded that it is not good to get too attached to these material things when my husband plunked himself down on an antique fiddleback chair that is designated as 'look only' ( he had stubbed his toe so is forgiven), leaned back and snapped off the back. I've been trying to simplify by cleaning out and give things away, but some things are harder to let go of. I think it can be glued, but it did come at a funny time - right when I was musing about all these things! Sometimes when I am too tired or too short on time, I will sit with my sketchbook and just doodle. 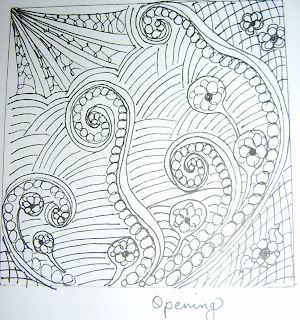 Facing the blank white page is always difficult, but for some reason when I follow the advice from the zentangle website and draw a frame first , it is easier. I started with a 3 1/2 inch frame and the funny thing is that I actually drew this the other way round. I like it flipped the way it shows in the photo. 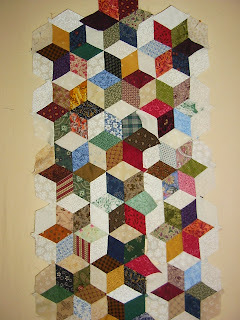 I will think about it for a while as I'm wondering if I could incorporate it somehow into a quilted hanging. Summer feels officially over for me now that i started back to work today. It was a busy day but a good day. I spent most of the day calling about 30 students to find out who is still attending. i will have 11 full time students start next Mon and another dozen or so on the waiting list. we are working on more space and another teacher as soon as possible. It was an lovely warm day though which I appreciated when I went outside. I just got back from a 50 minute bike ride out Saint Anne way. I've also been considering what I feel like working on next quilting wise. On Sunday I put narrow borders around my fishing huts when it occurred to me that it might make a nice pillow, so before I cut the next border I might check out the rectangular forms fro the sizes. It's not the best picture- a little faded looking, but you can get the idea. What do you think? It has been a perfect day! My husband vacuumed and cleaned the tent trailer this morning to get it ready to put away while I vacuumed in the house and hung out a load of clothes. after lunch he went to play golf and I went for a walk on the NB trail where I took a few pictures and gathered a few wild flowers for my front porch. Even as summer breathes it's last breaths the flowers are still beautiful. I love some of the dried seed pods that are left behind. My tomato plants are loaded this year; I must watch the weather for frost and get them covered at night. 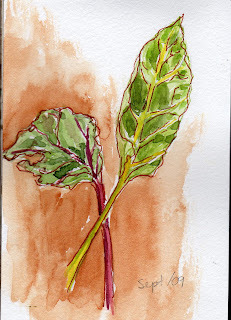 I put a small chicken in the oven, and then I went outside to paint a couple of small leaves of Swiss Chard. Tommorrow i go back to work. It is a short week and I have lots to do so I will be very busy. I've been doing a few odd little jobs and groceries today. Also, we took my 98 Neon to Canadian Tire to get a new muffler. As it turns out, it passed the safety inspection and only needed a muffler, and since it had a lifetime warranty, it only cost the labor. I have decided to keep driving it until something major happens. From the health food store, Patchouli, I picked up some orzo and I found the rice paper sheets to make the vegetable rolls that my friend Anne told me about. I have forgotten what she called them. They are very easy to make and delicious; I will be making them often for lunches. You soak the rice paper sheet for a few seconds, lay it flat anf=d fill with any fresh slivered vegetable. I made my own dip. Delicious! We also went for a bike ride for just over an hour and it was a real workout due to the wind. 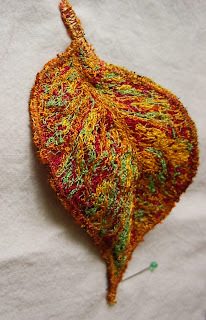 I am posting a picture of the leaf that I thread painted for the president's block at out guild. They would have all been passed in last week, so I think it's OK to post my picture even though the past president hasn't gotten it yet. As promised I am posting a photo of the hand pieced runner that I was working on while at the cottage. My friends will certainly recognize it as the one I started several years ago with the intention to use up small leftovers. I didn't think I was being too grandiose in thinking it might become a small lap quilt; however, it sat in the closet on the shelf while I completed other faster projects by machine. Now it's at least well on its way to becoming a table runner. I thought I was done all my summer traveling before I start back to work next week, but I had an invite from a friend to come spend a couple of days and a night at her lovely camp on the river. It was very peaceful and relaxing. We did a little kayaking, some walking and even went for a bike ride, but it was all very leisurely; even our meals were easy, but good. The bed was comfy, and I slept with a cool breeze drifting through the window screens. As for quilting, well there were no sewing machines to be heard, but we did do some handwork on the deck. I will post a picture of an old project that I worked on tomorrow. It has inspired me to get it finished.